Editor's note: Dear reader, on the first day of 2019, I wrote to you about the biggest trend of the year...and beyond. You simply cannot afford to under estimate this trend dear reader. It will create massive wealth building opportunities for you of the kind that will make the 1991 bull market look small in comparison. I strongly recommend you stay alert to these opportunities. I will recommend them as they happen. I'm sure you welcomed the new year with new hopes, aspirations, dreams, and resolutions. But won't be surprised if you have a nagging worry about new challenges. Especially, when it comes to the stock markets. The news is full of stories about macro risks, trade wars, oil prices, and interest rates. Everyone's saying the markets will stay choppy ahead of the elections. I have myself told you that the earnings recovery, while certain, will be slow. But today, I want to tell you something important about the stock markets in 2019. Something that no one else is talking about. And I want you to understand this right from the first day of the year. Because I believe this is not an ordinary opportunity. Well, the last time this opportunity came along, most people of my generation were kids or teenagers. And I don't think we will see another equally big opportunity again in our lifetime. This is not about another mini-bull market after the recent correction. And this is certainly not a speculation about any post-election rally. You have seen many such mini bull markets in the past decade itself - in 2010, 2014, 2017 and 2018. I don't want to waste your time talking about the next 10-20% upside. Rather I'm hoping that what I tell you know makes a lifetime of difference to your stock market fortunes. I'm no historian or fortune teller. Whatever I am going to tell you will be in the context of building wealth with stocks. I am seeing trends now that India has not seen in the past 5...10...15 or even 20 years. As I write this, the latest news update tells me that India has pipped China in FDI inflows for the first time in 20 years. If you think that's a one off, let me tell you...it's not. The Indian stock markets are on the verge of seeing a flood of liquidity starting 2019. Foreign pension funds are making a beeline for Indian stocks. Our own National Pension Scheme will gather steam with recent tax benefits. It could allocate as much as 50% of its corpus to equities. Most importantly, a much larger section of Indian households will seek to create long-term wealth with stocks. Equities as a share of financial assets of Indian households never crossed 10% since 1993. Even when they came closer to 10%, again in 2007, the investor base was tiny. Both in 1993 and 2007 the country had a miniscule proportion of demat account holders, and the stock markets were extremely frothy. However, this time, even as equity investments (direct and via mutual funds put together) seek to cross the 10% mark, I don't see a reason to worry. The proportion of stocks that Indians own will only get bigger and bigger over the decade. First, there has been a huge surge in a demat account holders over the past two years. Most of them are not traders or speculators but genuine investors. Second, stock markets valuations are far from being frothy. Rather, as and when earnings revert back up to their long-term averages, markets could actually start looking cheap. So, for the first time ever, a majority of Indian households, will start to benefit from stock market wealth. Like they say the proof of the pudding is in eating it. So as stock markets become the go to long-term investment avenue, for at least a million odd Indian households, a wave of liquidity will chase fundamentally sound stocks. FIIs or no FIIs. Low or high interest rates. The fortunes of Indian stock markets will no longer be dependent on hot money. India's economic rebirth will be most be evident in the manner in which the surging Sensex adds to household wealth. On a tiny base of domestic investors, the Sensex went up 10 times in the past 15 years. Imagine the Sensex level when a large proportion of Indians start investing in the market? I dug out all the details and did the math for you. This will be something big! Coming back to FDI, India's manufacturing sector has been long seeking such stable long-term funds to accelerate capex plans and technological innovation. The FDI into India exceeded that into China in 2018. That is a testament of the fact that India's foreign investment policies and business environment are finally competing with that of its Oriental neighbour. The biggest deal that drove FDI flows to India this year is Walmart's US$ 16 billion buyout of Flipkart. Apart from ecommerce and the digital payments boom, the new bankruptcy framework is also attracting foreign investors with deep pockets. India aims to receive US$ 100 billion in foreign direct investment (FDI) in the next two to three years. Special industrial clusters are being created for countries like Japan, South Korea, China, and Russia where their companies can invest and operate. 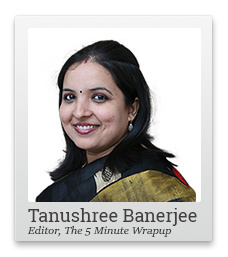 PS: Tanushree Banerjee, editor of StockSelect, is working on something big. She will soon announce it to the world. It is a huge trend that will create mind-boggling opportunities to profit from stocks. You can get access to these recommendations as a premium subscriber by signing up here. Equitymaster requests your view! Post a comment on "The Biggest Trend That I'm Seeing in the Market Today". Click here!